Ittou Ogami has very little left to live for. Though once the Shogunate's chief executioner, his name is left in ruins after being framed for treason by the treacherous Yagyuu Clan, seeking to steal his position of power. His misfortune does not end here, however; they culminate in the brutal murder of his entire family, including his wife Azami, with only his child Daigorou still left alive. With dishonor upon his head and his beloved wife in the grave, Ittou takes up a new mantle as an assassin for hire. Alongside his young son, Ittou wanders the country in search of revenge, with only the complete destruction of the Yagyuu Clan on his mind. As he travels the land, the number of his successful assassinations quickly grows, and soon the moniker of "Lone Wolf and Cub" becomes infamous across the land as the choice assassin to get the job done right. Kozure Ookami was published in English as Lone Wolf & Cub initially by First Comics in 1987 as a monthly comic book sized series featuring cover illustrations by many renowned comic book artists such as Frank Miller. Each issue contained around 64 to 128 pages, but publication was cancelled at 45 issues after the company's shutdown in 1991. Dark Horse began republishing the series in traditional tankoubon format form September 12, 2000 to December 24, 2002, as well as in 2-in-1 omnibus volumes from May 22, 2013 to April 26, 2016. In 2001, Dark Horse's edition won the Eisner Award for the Best U.S. Edition of International Material. The manga was also published in Brazilian Portuguese by Panini Comics/Planet Manga from December 2004 to April 2007, and began republishing in December 2016. The series has been adapted into multiple live-action films, television series, and stage plays. There are many anime and manga that can rightly be considered classics for one reason or another. Of these, only a few can surpass this status and truly be considered masterpieces in the purest form (and when I say a few, I mean exactly that). Supreme amongst these titles is a manga that is considered the single most influential piece of literature (and I do not use that word lightly), to come from Japan during the 20th Century. That manga is Lone Wolf and Cub. The creation of writer Koike Kazuo and artist Kojima Goseki, the story tells of Ogami Itto, the Kogi Kaishakunin (Shogun's Executioner), during the time of the Tokugawa Shogunate. He returns home shortly after the birth of his son, Daigoro, to find his wife and retainers brutally murdered, and himself suddenly named as a traitor who is expected to commit seppuku. Instead, he gives his 1 year old son, the only survivor of the attack, the choice between a ball and a sword. Should his son choose the ball, then he will be sent to his mother's side. Should he choose the sword however, then he will join his father on the road of blood and vengeance, of slaughter and heartless cruelty. To say that the story is breathtaking would be an understatement. There are very few words that can truly convey the depth of the individual tales, or the depth of one's emotions as you join Ogami and Daigoro on the road to meifumado (the buddhist hell). This is a work that will evoke almost every emotion you'd care to name, from righteous fury to heartwrenching sorrow, from earnest hope to blind hatred. The complexity and detail of the plot reveal a level of sophistication that many have tried to copy over the decades since its release, but none have managed to better. The episodic format of the series allows the reader a greater degree of accesibility to the story, whilst losing nothing in terms of character development. If anything, the format actually enhances the various roles, with a number of characters being far more "real" in just one appearance than many lead characters in other stories. The artwork of Kojima Goseki is nothing short of exquisite. The style adopted throughout the series has a certain gritty realism to it, whilst retaining an expressionist form reminiscent of traditional Japanese art. Kojima's simple, yet evocative, style allows for a greater degree of expression than can normally be found in manga, with the characters themselves retaining a feeling a reality. The quality of the artwork, together with Koike's gripping storyline, allows for a suspension of disbelief that is difficult to match by any other series. The characters are wonderful in their uniqueness, style and personality. Ogami is a truly complex and many layered character. An assasin with a strong sense of nobility, a "demon" who is a loving father and husband, a symbol of hope for some, terror incarnate to many. Daigoro, on the other hand, is how one would expect a child to be, innocent, playful, and with very few cares in the world. One of the most wonderful things about the series is the how it addresses the bond between father and son, and in many stories Ogami bets his life on the strength of this bond. In a very real sense, he is trusting his 3 year old child to "watch his back", and this leads to some truly astounding development between the two, especially at the end of the series, with it's truly awe-inspiring climax. There are many other characters who appear throughout the series, however the majority will only appear in one story or another. However, this does not impact on their level of realism, as many of the characters with only one appearance possess an enormous amount of depth from the start. In the case of Lone Wolf and Cub, enjoyment is purely a specualtive term. The level of realism in the series is breathtaking, and the various action sequences will often leave you speechless, with the most exhilerating being the 178 panel sequence (you'll know it when you read it) - possibly the longest fight ever portrayed in manga. The scope of the series is of epic proportions, with each panel searing white-hot across one's mind, and unlike many other long running series, this never gets old or stale. I first read this back in 1989, and 20 years later I still get chills whenever I pick it up again. This is a series that you will find yourself re-reading for years to come. This masterwork of the storyteller's art has had incredible and lasting influence both inside and outside of Japan. As well as spawning 7 movies and various TV movies, the series has also been adapted into two TV series and four plays. In terms manga and anime, one need look no further than Rurouni Kenshin, Hokuto no Ken, Black Jack, Vampire Hunter D, Mushishi, etc. In addition to this, the influence on Western media has been just as great. Comics and novels such as Sin City, Cable, The Road, Ronin, Road to Perdition and Waylander all pay homage to the series, with additional references being found everywhere from Final Fantasy and Samurai Jack, to Usagi Yojimbo and Kill Bill. 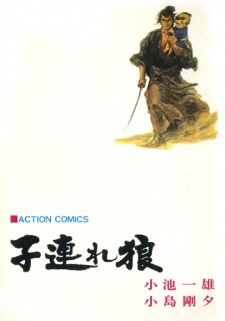 Lone Wolf and Cub is a work that has truly crossed the boundary between popular media and true literature. The style, pace, artwork and characterization throughout the series are the benchmarks by which many mangaka set their standards. The global popularity and influence of the series crosses the boundaries of age and gender, with many fans of the series being uninterested in other manga and anime. Lone Wolf and Cub is, by any measure, a true masterpiece. Even now, as I close off this review, I still feel I haven't done it justice. Lone Wolf and Cub was my introduction into manga. It was my first and to this day remains my favorite. It showed up one day at my local comic book store in 1987 and the first 10 issues the covers where done by Frank Miller.Well that first publishing only had one chapter per book as opposed to the 4 or five per a Japanese volume and it only lasted 43 chapters. Those 43 chapters were so good I dropped 90% of the American comics I had been reading and went on the hunt for more Manga, it was the start of my love for manga. I had to wait 10 years for Dark Horse to pick it up and then in August in 2000 they started issuing English volumes. This manga was that good, it made me pursue it for 10 years. Keep in mind 1987 was back in the day where internet access was via dial up only and for a lot of people that number was a long distance call too, so the Manga scan culture was not really that big if it even existed back then. By 2000 I had high speed access and there was a manga scan culture and community but it was not nearly as dynamic and large as it is now. Lone Wold and Cub is a fantastic story, and has wonderful art and blew away anything the American comic book shelves had to offer. Frank Miller saw this and even did the first 10 covers a wrote an introduction. This is a classic, if you like action and good art this is a must read. One of the few masterpieces out there, a very poignant reflection of the harsh realities of revenge and the lengths people go through in order to achieve it. I really thought the art was wonderful and each chapter was as gracefully written as the next. I also thought the fight scenes were superb, the frames were so well tied in with each-other it was very easy to visualize. The story was a simple enough one but beautifully told, and the characters were incredibly complex, it was such a thrilling manga! Irregardless of what I say, this will go down as one of the best pieces of manga in history and you have a golden opportunity to be part of it. Lone Wolf &amp; Cub is more than my favorite manga, it's one of my favorite literary productions of any kind. The brutality and horrendous violence presented here manages to deliver some of the most poignant, meaningful stories I've ever encountered. Many of the quick vignettes just make you think or are entertainingly witty, but some (primarly those focusing on young Diagoro) can be down right tear jerking. Watching these small stories come together to weave the arching narrative is beautiful to behold. I intend to be reading this title for years to come, and have it impacting my life for long after that. Most the time -- I read manga because it's fun. LW&amp;C though, I read because it moves me.